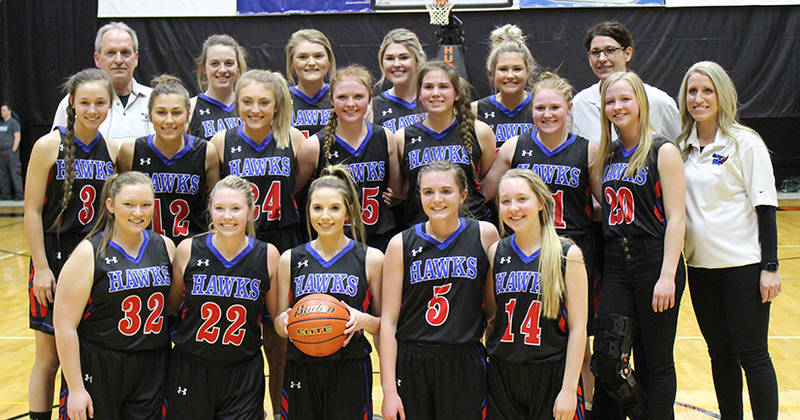 Last week, the Lady Blackhawks competed in the Region 4B Tournament held in Sanborn Central and Huron, and they came home with two wins and an opportunity to compete in South Dakota’s second SoDak 16 ever. On Tuesday, the Lady Blackhawks hosted Colman-Egan in Forestburg for their first game of the region tournament. The ladies advanced to the finals with a win and a final score of SCW 45, Colman-Egan 38. That victory brought the Lady Blackhawks up against the Hanson Beaverettes on Thursday, Feb. 21 in the Huron Arena. They brought home another win with a final score of SCW 49, Hanson 46. The ladies now play DeSmet in the SoDak 16 on Thursday, Feb. 28, in Huron and with a win there, they will be on their way to the state tournament that takes place in Huron on March 7-9. …Read details and see more pictures of the games in this week’s issue of the Sanborn Weekly Journal! Camden Jost has his opponent in a headlock to work for the pin and the win in the Region 3B Tournament on Saturday in Parkston. 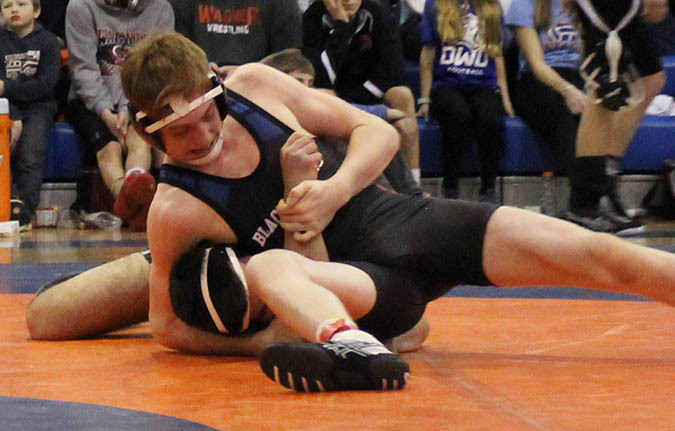 The WSWWW wrestling team competed in the 3B Region Tournament on Saturday, Feb. 16 in Parkston. There were 13 teams in attendance, with each wrestler working for a chance to compete at the state tournament this weekend. The WSWWW team finished in seventh place, which is a clear impression of how tough their region is because WSWWW has finished in the top five in all the tournaments they have attended in the regular season this year. Unfortunately, the only other senior on the team, Henry Eichstadt, broke his wrist in his first match of the day, so he was out of the competition and done for the season, after performing well all year. WSWWW also had four other wrestlers just one match away from advancing to the next level, so things look good for next year, also. The state tournament takes place this weekend, Feb. 22-23, in Rapid City. …Read more details about the tournament and see an additional picture in this week’s issue of the Sanborn Weekly Journal! Tater Moody shoots up a jump shot during the Mitchell Christian game last Thursday night. On Thursday, Feb. 14, the Blackhawks traveled to Mitchell to compete against the Mitchell Christian Golden Eagles. For the varsity action, the Blackhawks brought home another victory with a final score of Blackhawks 58, Golden Eagles 43. The boys are now 11-8 for the year, and they will have their last regular season game on Friday, Feb. 22, vs. the Wessington Springs Spartans. …Read details of the game and see an additional picture in this week’s issue of the Sanborn Weekly Journal.